House training older dogs is a more delicate process than with younger dogs. If you are looking to adopt an older dog that was not previously exposed to any house training at a young age, it is going to bring along its bad habits such as chewing, excessive barking, making holes in the yard or "marking" the territory. Furthermore, you will also experience more difficulties in house training older dogs as they tend to respond and progress much slower to most training methods and commands than younger dogs. Here are 3 useful tips that can help you in house training older dogs successfully. *First and foremost, a complete check-up at the vet is necessary in order to eliminate any existing health problems or complications such as urinary tract or flea infections. Older dogs may also experience some form of diarrhea if there is a sudden change from their previous dietary habits. Do not punish him for these "mistakes". Instead be patient and allow your dog a week to adapt to the changes gradually. If conditions did not improve, consult your vet. Always establish a routine schedule for eating and drinking for your dog. This helps you to easily monitor your dog's toilet habits and decide when to bring your pet out for a walk every time he or she finishes its meals. Most adult dogs tend to eliminate 30 - 45 minutes after eating or drinking. Learn the signs and watch out for clues of circling and sniffing the floor. Older dogs have shorter attention spans therefore more repetitions are needed during the house training process to reinforce the desired habits. Never use violence on them if they make a mess in the house. Scolding the dog is pointless unless you actually see it eliminating indoors. 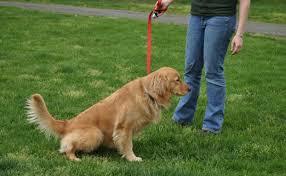 Use a firm voice command "No" and guide the dog to its designated spot. Praise or reward your dog when it relieves itself outdoors. Therefore, house training an older dog successfully depend a lot on your consistency, discipline and perseverance. Treating the dog with patience and understanding, using the appropriate house training methods are the main ingredients to developing a well behaved adult dog with good toilet habits. As a dog behaviorist for over 20 years I've seen 'quick fix' methods come and go. But typically these devices, such as bark collars, are only treating the symptoms and do nothing to address the cause of the behavior. There is so many different opinions about this and whether it is good or bad for the dog. Find out the pro's and con's such as the health benefits and if eggs can cause any problems. 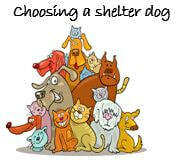 Going to a shelter to choose a dog can be an emotionally draining exercise, and often you pick the wrong dog out of sympathy. Do some homework on what you are really looking for and make the process so much easier.